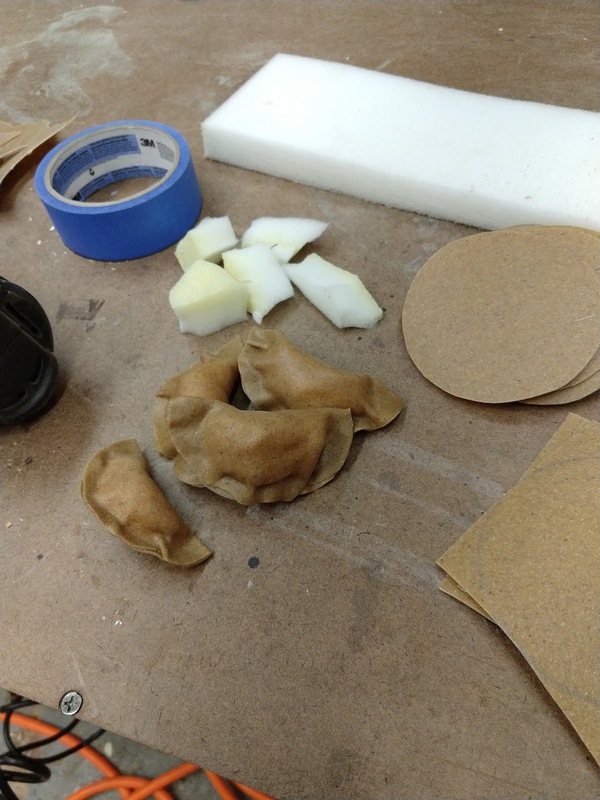 The process for worbla dumplings is actually really simple, if you have a heat gun and some upholstery foam scraps. All you need is to cut circles of the right size out of the worbla, heat the circle, and proceed as if you were filling real dumplings with pieces of unevenly torn upholstery foam. The worbla can get too hot and get kind of melty- just wait a second for it to cool back down again without touching it and it will solidify back into something usable. If it's burning your fingertips it's too hot, and you can always reheat it so I usually let it cool a little before trying again, but getting the hang of worbla heating and forming takes knowing how it should "feel" so if you've never used it before, practice on a scrap piece. 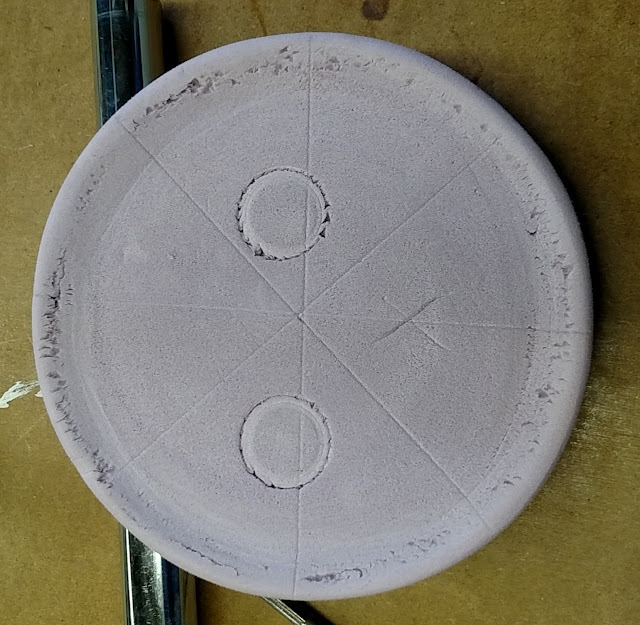 1. put some filling in the center of the now pliable circle. 2. fold the circle in half over the filling. 4. 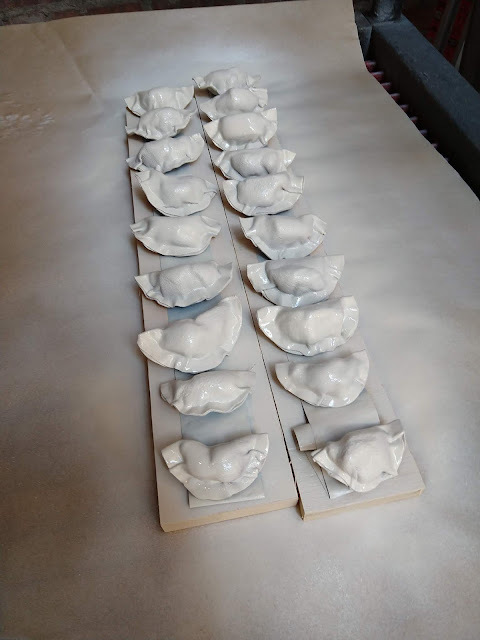 (and this is the bonus step you do with the prop but not a real dumpling) tug the ends a little towards the middle of the dumpling, so that they have a more realistic and varied gather/ruffle to the edge. 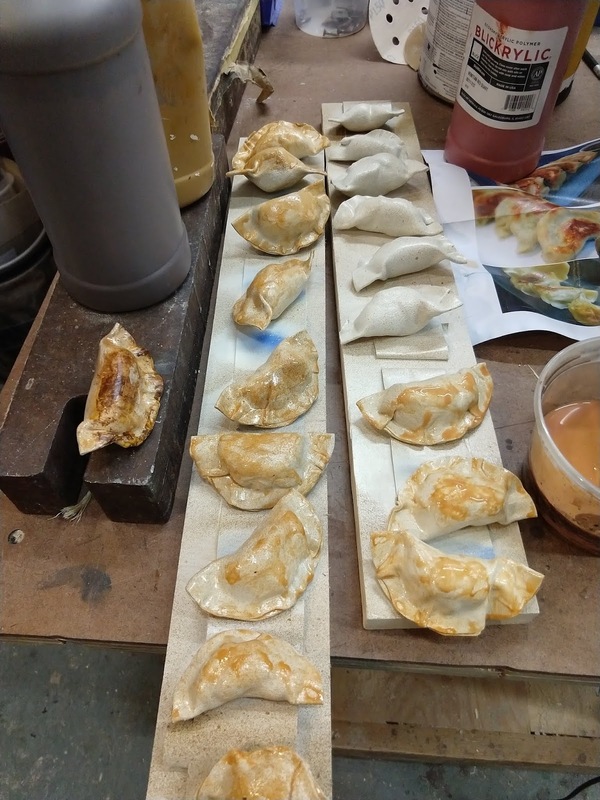 Basically its easy for something as solid as worbla to stay in a perfect half moon shape at this point- and real dumplings definitely have a little more variety. Then, on to the paint process. If I recall correctly, I did a solid coat of almond spray, and then brought them in for a hand brushed process. 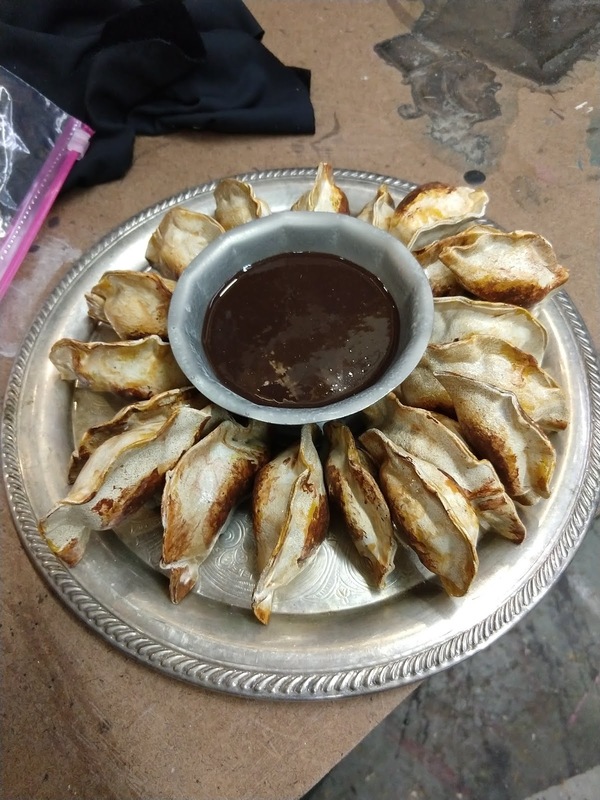 The first layer was a glaze (gloss sealant with a little bit of orange paint in it), which I let pool in various places of the dumplings strategically to give it that "tossed in oil" shine. Also, my trick for any prop that needs color but can't look like someone applied that color, is to brush the paint on and then dab at it with a dry rag while it's still wet until it looks right. This gets the paint to smudge into the edges and leaves it with a natural feel. Of course we immediately discovered that they didn't want dumplings: they wanted samosas, so I got to go back and make more filled dumpling treats. 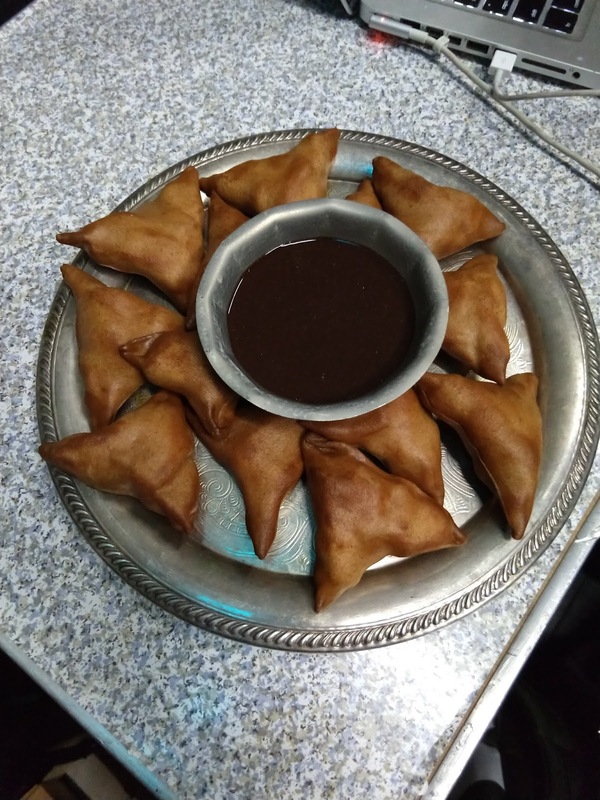 Samosas are a little more complicated to fold but they have the same basic idea: fill the center and wrap the worbla around it. 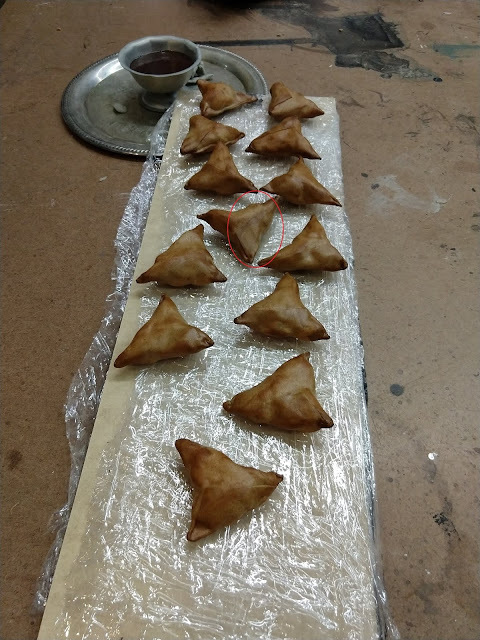 In this case, real samosas are actually a much thinner dough wrapped four times around the filling, but the worbla was too thick to have that turn out well, so I truncated the shape and hid the pressed edge in the presentation on the plate. I've traced my fold lines in this photo in Photoshop so you can see what I did. I've also circled the end of the fold over in this photo so you can see where the folds landed. The other trick with folding the samosas was to be careful that the corners of the triangles stay crisp and don't elongate; they had a tendency to push against each other to make ears instead of points. Usually I was able to catch this and gently nudge them back into place before they cooled, and remember you can always reheat worbla to reshape it, so if it cools weird its not the end of the world. 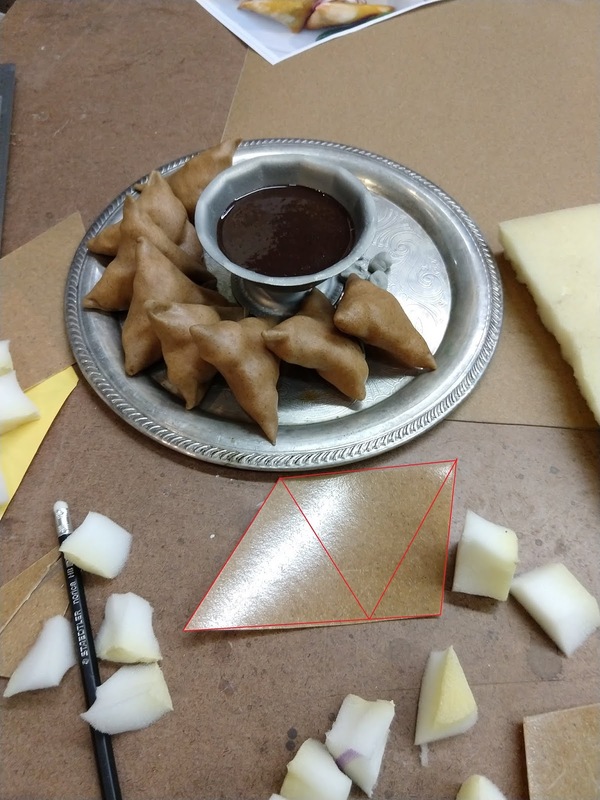 The paint process for the samosas was a lot simpler than dumplings: since the worbla was already a good brown color I just hit them with a little of our best friend, Glossy Wood Tone (Design Master spray) to give them that good, deep fried sheen. 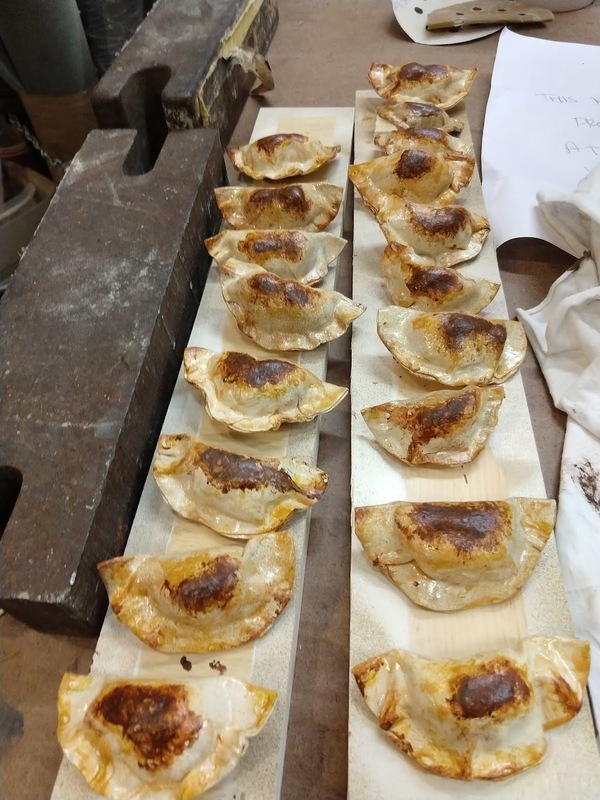 Since samosas are deep fried I didn't need to add the gloss to the paint process that I needed for the dumplings. The dipping sauce was just a heatable gel wax, which forms a nice solid sauce with a good sheen, is pourable when hot, and cools to a sort of jello-like texture. Of course, mortite these down to the tray for minimal spillage and you're good to go! I don't know about ya'll, but I think I need some fried dough pockets. I don't have any experience with Worbla, so this was a great tutorial for me as well! I'd apologize for the Ben Wyatt gif, but I'm not sorry. There will be an upcoming post about Gel Wax, as I've recently done a bunch of food with it, and it's so great. Thanks for your great tutorial, Helena! You can check out her other projects over at HelenaProps.com. Happy FFFriday! Hi All, welcome to our first Fake Food Friday! I thought it would be appropriate to have our first FFF be the prop that started it all! 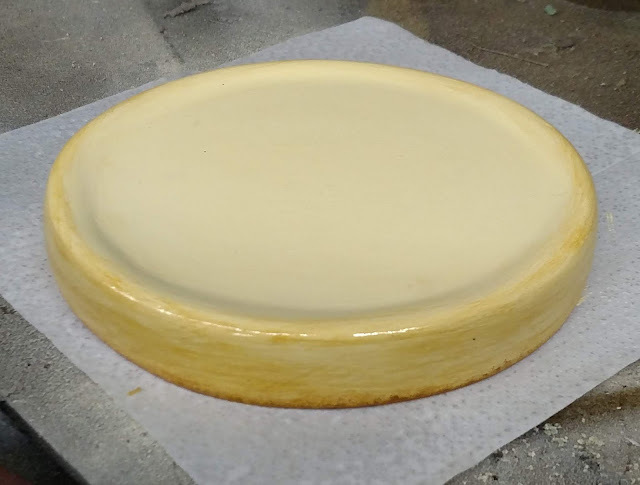 This cheesecake and its plated version were for You Got Older at Steppenwolf. 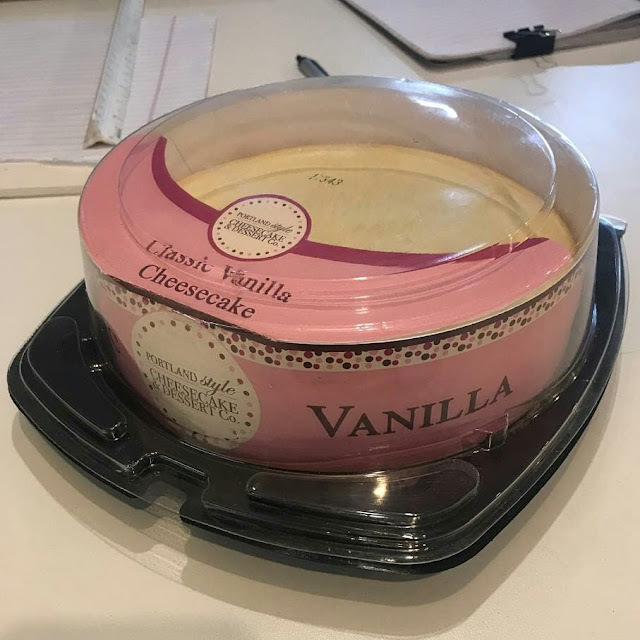 The packaged cheesecake came out of a grocery bag, and then later it came out on a plate, had two full size taper candles put on it, and two pieces cut out. 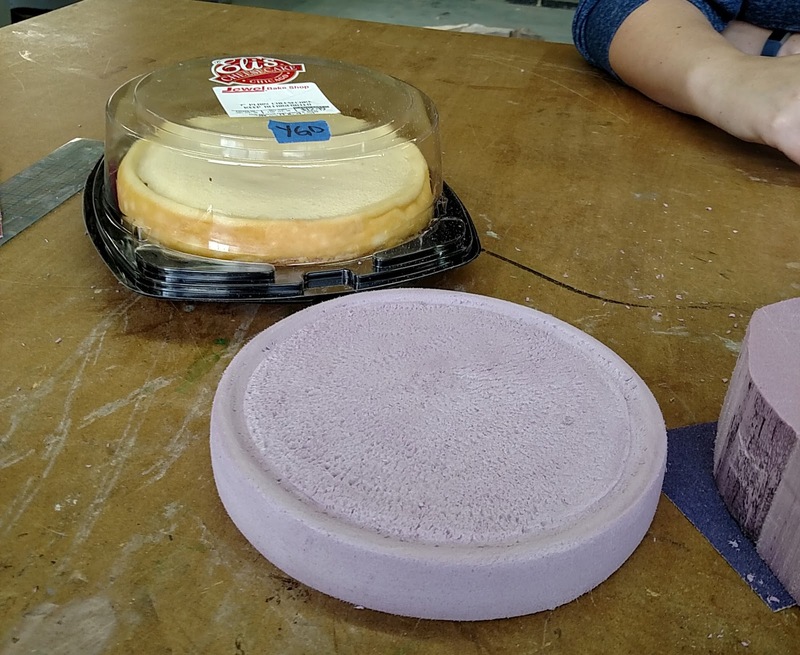 I started out with 1.5" insulation foam, cut into circles about the same size as my research cheesecake (yes, we all ate some after I was done!). I used a Surform shaver tool to shave down the middle and give it a bit of an edge. I then sanded that down, but I didn't spend too much time smoothing it out, knowing I was going to foamcoat it. 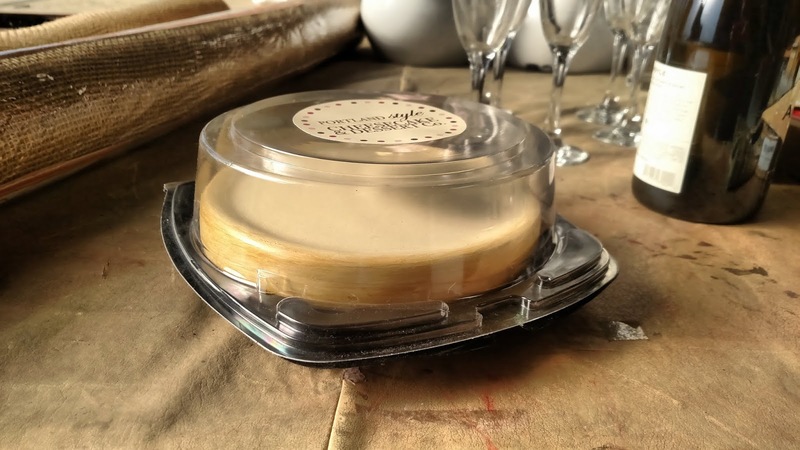 For the practical version of the cheesecake, I cut out two holes and inserted PVC pipe ends that fit the candles pretty well. Then I did several coats of Rosco Foamcoat. I tinted it by adding a bit of acrylic paint. I built up a nice shell on the practical version and then cut out a quarter of the cake. 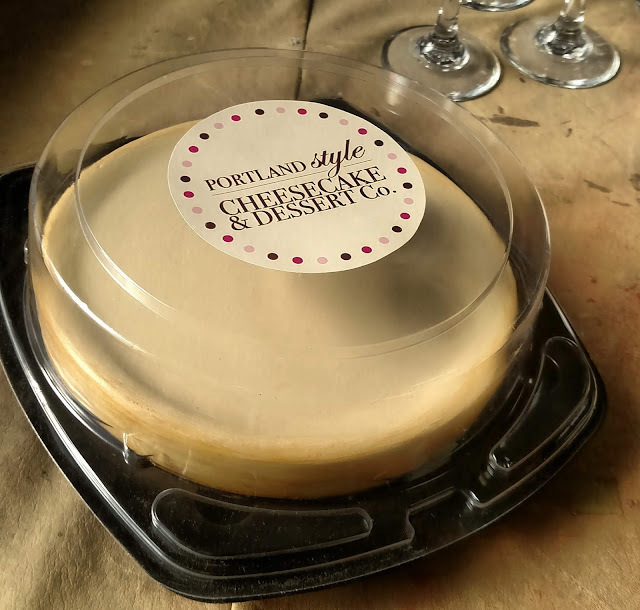 It was filled with a quarter of real cheesecake for the show, and then a layer of cheesecake filling (which is totally delicious and something I have 100% eaten straight out of the tub.) And then I sanded it SO MUCH. 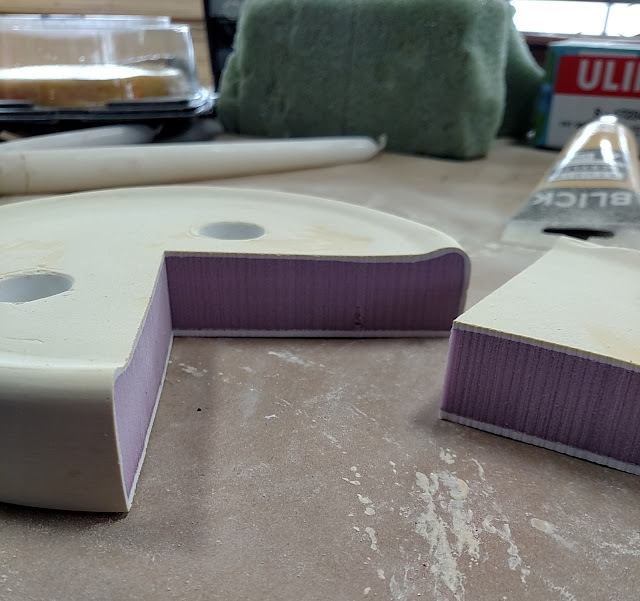 Because the foamcoat was already yellow, I didn't have to do much finish painting, but I did add a quick coat of light yellow and brushed on a bit of raw sienna to make the edges look cooked. I then sealed the full one with clear satin spray. For the practical cake, I sealed it completely with epoxy because I knew it was going to be by real food and washed every night. I ended up sanding it down with some 220 grit sand paper so it wasn't too shiny. I didn't get a picture of it though. As we like to say on this blog, packaging SELLS IT. This shell is from our research cake, which was conveniently empty by then... I found a logo online and printed it on some sticker paper. As I said when I first posted it, I'd eat it. Unfortunately, my sticker was too subtle and we ended up taking the insert that came with the cheesecake, scanned it, and edited it so it was no longer so Chicago-y, (speaking of, if you find yourself in northern IL, I highly recommend trying some Eli's Cheesecake, which served as research and supply for our show). This shop had a tabloid size printer, so we were able to print this on one sheet, making it look super professional. Even though you can't see much of my cheesecake, I'd still eat it. There we have it, folx! I think I need to go get some real cheesecake. Or just some filling, I'm not picky. Happy FFFriday!